The National Collegiate Hockey Conference released their second annual Preseason Poll Thursday, and the University of North Dakota was picked to win the regular season title by the media. UND received 12 first place votes, and Miami came in second with nine first place votes. Finishing third, Saint Cloud State received four first place votes. The NCHC Preseason Poll was released in advance of the league’s second annual media day at the Target Center in Minneapolis, Minnesota. 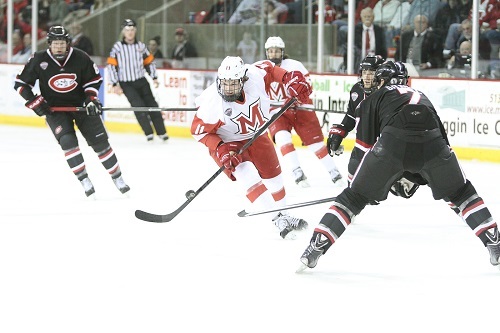 Last season, Miami was tabbed by the media to win the NCHC’s inaugural league title. Miami went on to finish in the cellar of the NCHC standings. Miami recovered in the NCHC playoffs and lost to Denver in the championship game of the Frozen Faceoff. Miami looks to improve on last season’s poor showing and make a run towards the NCAA tourney. UND fans are hoping that being picked to win the regular season title isn’t the kiss of death. Like Miami, UND should be a very good hockey team with solid goaltending. Junior goalie Zane McIntyre (20-10-3, 1.99 GAA and a .926 SV%) leads UND. On the back-end, UND returns one of the best defensive corps in the NCHC. Last season, UND had the top scoring D-corps in the nation. The UND defensemen averaged 2.76 points per game. Last season, UND was one of only two teams that had four 20-point scorers on their blueline. This season, UND returns three of those four defensemen. Miami picked to finish second by the league media, returns a very talented group of offensive minded forwards. The RedHawks are lead upfront by forwards Austin Czarnik (13g-34a—47pts), Riley Barber (19g-25a—44pts), Sean Kuraly (12g-17a—29pts), and Blake Coleman (19g-9a—28pts). Those four aforementioned players scored 63-of-111 or (.567 percent) of Miami’s goals last season. The Saint Cloud State Huskies are the defending Penrose Cup Champions and look to repeat. The Huskies return a very talented, offensive minded squad that scored 136 goals last season. Jonny Brodzinski (21g-20a—41pts) and Kalle Kossila (13g-27a—40pts) lead the Huskies up front. The biggest question facing the Huskies this season is the goaltending position. Junior goalie Ryan Faragher decided to forego his final year of eligibility to sign an entry-level deal with the Anaheim Ducks following the 2013-14 season. Sophomore goalie Charlie Lindgren (2-2-1, 2.42 GAA and a .905 SV%) has limited collegiate experience. As we saw last season, this league is going to be a war, week in and week out. It really doesn’t matter where a team is picked to finish in the preseason polls, they’re meaningless once the regular season begins. Last year, we had three or four teams battling it out for the regular season championship on the last weekend of the season. I see no reason that can’t happen again this season.